In Stuttgart and Böblingen off-post there is a ordinance to regulate how residents clean and clear their sidewalks that differs from most American States in regards to salt. It states that salt or other melting materials are not allowed. Only materials like sand, gravel or other salt-free material is allowed. Exceptions are at dangerous locations, e.g. stairs, steep slopes. Usage is to be kept to a minimum. There is also a traffic ordinance in Germany stating that drivers must clear the car from all snow and ice on all windows. Additionally, the vehicle must have the proper tires (including the M+S or snowflake w/mountain peaks symbol, or all weather tires). This is mandatory and could result upon a fine. Read more about winter driving. Salt Usage Rule of Thumb: Approximately 20 grams (1 tablespoon) per one square meter (11 square feet). This is about one handful for 24 m2 (258 sf). Snow and ice are slippery hazards. 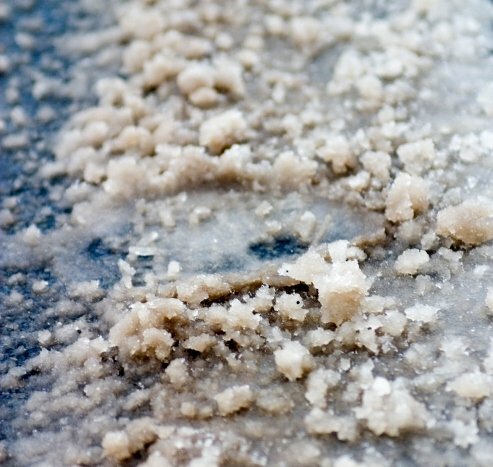 De-icing salt has long been the most common way to clear snow and ice from sidewalks, roadways and driveways. While it’s convenient, there are environmental drawbacks. Ecosystems adjacent to salted roads are often damaged by the contact. Plants are damaged or killed as salt burns the roots of trees, bushes and grass when the water and soil is contaminated. In severe cases, wildlife can become ill or die. Salt can also cause serious damage to lawns and gardens, and cause corrosion on metal and concrete buildings. Usage of gravel is preferred as it is not easily drained into the water run-off and can be swept of the sidewalks easily. Ash and sand can be used as well but need to be cleaned up before being washed into the water drains to prevent clogging. The same applies if using kitty litter. Using a small amount of de-icer before a snowfall helps reduce the amount of product needed. Use elbow grease — shovel quickly, use a broom and something to break any ice. In Germany, there are several re-usable salt-free abrasives available. For a list of manufacturers, visit here.